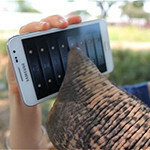 Hey, now we know the target demographic for Samsung’s Galaxy Note; proboscideans! We jest, we jest. Still, for those of you who were skeptical of the size of Samsung’s popular phablet, we imagine that seeing Peter the elephant use it will only reinforce your cynicism. Of course the Galaxy Note is selling well, so clearly there are non-elephants out there who like its form factor. Regardless of your phone-size preference, Samsung’s latest promotional video is pretty amazing to watch – it’s a real-life Asian elephant (notice the smaller ears) playing with a Note, exploring musical instrument apps, snapping photos (with a trainers help), and even drawing with the stylus. no suprise here.. chimpanzees have been using Samsung products for years now..
What is a good product in your mind? cant you recognize a troll when you see one? The iPad is made up of many Samsung parts and components especially the resolutionary 'apple' screen,are you therefore self confessing to be a chimp?! @andro. S/he sounds more like a chump than a chimp to me. Don't know why but i found that comment funny! I'll be honest, until I saw the whole elephant painting the rose, I actually thought it was something commissioned by Apple as one of their iPad claims. Amazing video and amazing elephant (sort of reminds me of my brother's wife). no sh!t,everytime i look at the last part it kinda makes me laugh again, i can only imagine what kinda wife your brother got...LMFAO!!! correct me if I'm wrong, but isn't this advertising kind of like saying "if you have hands like an elephants, then this phone is for you." cuz that is the first thing that came to mind when I saw the title.